Big step, making that first choice, what kind, what size, what caliber? Well my first piece of advice is do a lot of shopping, but no buying to begin with. A new firearm, can be a sizable investment, and you do not want to find out after the fact, that your purchase is too large or too small or too powerful for you to control, or not suitable for what you plan to use it for. Ask any of your gun owning friends or relatives what they like, now their choice may not be your choice. It will give you a chance to handle different guns, you can ask questions, learn what the parts are, and in general what certain types cost. They may even offer to take you to the range to try their guns out, if they do at least offer to cover any expenses, or at least offer to buy lunch. Do keep in mind most gun owners have favorites, and think or believe there choice is not only the best choice, but in some cases the only choice. Consider taking a basic course, the NRA offers many, and most of the basic ones the instructor will provide a firearm, if ask. He or she may also have suggestions on firearms suitable for your needs, note I said suggestions. Also many gun ranges have rentals, so for a few dollars you can try a gun that interests you, without spending hundreds of dollars. One thing is you will hear certain brand names repeated over and over, and it is a good idea to stay with a popular brand, such as Glock, or Smith & Wesson, Springfield Armory, the list goes on, as there will be more accessories available, magazines, holsters , and parts will be readily available. If you purchase some off brand you might have problems finding a proper holster, or magazines might be more expensive. You might even consider used, and sometimes you can save some on a used gun, although if it is your first, I’d recommend buying from a dealer, they will usually give some limited warranty, maybe only 30 days, but if you get to the range you’ll soon know if there are any problems, or you might able to purchase from a trusted friend, just make sure you do it legally for the area you reside in. Unlike cars, guns don’t come with round counters, and there are a lot of back room gunsmiths, that can ruin a perfectly good firearm, so practice caution on purchasing used. The first thing is how does the gun fit you? 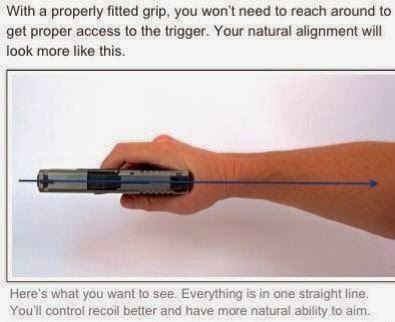 Here I mean physical fit, of the grip, some guns can be too small in the grip, and some can be too large to get a proper grip, taking that class might come in handy so you understand a proper grip. After you handle a few, you’ll notice the difference in grips. Now to size of the gun, perhaps you think you need something really small for concealed carry, look at the compact beside a standard size gun, and you may be surprised there is not that much difference, in a given caliber the felt recoil is less in a standard size gun than a compact, given the standard gun will be slightly heavier, and dampen a bit of recoil, it really is plain old high school physics. The standard size gun will be more comfortable to practice with, and really isn't any harder to conceal, and the more you practice the more confident you’ll be in your ability to use the gun. Also the standard size gun will have a slightly longer sight radius making a bit easier to shoot accurately. As to caliber, if shopping for self-defense, .380, 9 mm Luger, 40 S&W, and 45 Auto in semi-automatics, and 38 Special and 38 Magnum in revolvers. There are other choices, but these are the most popular calibers. .380 can be an adequate defensive caliber, but is more expensive and less powerful than 9 mm, and most of the guns chambered in this are small, and many have hard trigger pulls. 9 mm Luger, is perhaps the most all round caliber, it usually is more affordable than other calibers, as they make so much of it, it is suitable for self-defense, as well as target shooting, and you will find a wide variety of guns chambered in 9 mm. The 40 S&W while it was popular with law enforcement, many police departments are switching to 9 mm, the 40 has about 25 % more recoil and costs more than the 9 mm, then the 45 Auto is an excellent defensive round, but the down side for many is the cost, usually about 40% more than 9 mm. recoil is more than 9 mm but it is usually more of a shove than a kick, unless you are shooting one of the really small ones. While I’m not a big wheel gun (revolver) they are a bit harder to conceal than an auto, the 5 shot “J” frames are not the easiest guns to shoot, and for many they find the recoil to be excessive. But if it were the choice, I’d pick something rated for 38 Special + P (higher pressure rounds), I would use standard 38 special to practice, and load it with +P for when I’m carrying. The course time is divided about equally between classroom sessions and range firing, and each student will fire approximately 1,000 rounds of ammunition. Students will act as coaches for other students, and each will be coached extensively in turn. Students also receive a 170+ page training manual, which is a valuable information and reference resource. To graduate from this course, students must pass a shooting qualification, pass a written examination, and conduct a brief presentation in the classroom on an assigned topic. Everything else is supplied by Rangemaster. Tuition is $525.00, which includes 24 hours of training and a 170+ page training manual. Advance registration is required. Take your time holstering, and get that booger hook out of the gun! So you have your CCW, and are considering, taking a firearms training class. There are a few things to consider, and certain preparations, will allow you to get the most for your training dollar. Understand the difference between an average CCW and an intermediate or advanced training course. Most Concealed Carry classes, are very basic, and most are classroom based, covering the basics of handguns, and safety, fundamentals of shooting, maybe a review of the laws, with some actual shooting. Intermediate and advanced classes will have little if any classroom, and they are ranged based to the practical side of shooting. In many areas, you sign up and take a CCW course with little or no equipment, the instructors usually have loaner guns, and whatever else is needed to get you started, and most are comparable to taking a test drive at a local car dealership. Now if all you have is training from a CCW class, and perhaps a few trips to the local range, where you have to stand stock still, and not shoot more than one round a second, you will be woefully unprepared for an “Advanced” class, especially from some of the big name trainers, you’ll be in over your head and you’ll spend most of your time trying to catch up, rather than actually learn anything from the Instructor. Now that you have decided to take a class, take a look at your gear, if you have signed up for a class, the trainer will very likely have sent you an equipment list, pay attention to it. For most classes you will need a handgun at least 3 magazines (more is better), a holster and a certain amount of ammunition. A decent, and proper holster for the class, if the list says strong side holster, do not show up with your shoulder rig. You will want a holster that stays open when you draw, and stays on your belt when you draw. While you are at it, take a good look at your belt, and yes bring a belt, which also means you need pants with belt loops. You will find hanging a cheap soft paddle holster to your sweat pants a huge hassle once class starts. You’ll also need hearing and eye protection, and something to carry it all in, besides a plastic bag from a big box store. There may be other items on the list, and if you are not sure, ask. Also important to ask if there will be things like water or lunch provided, or if you also need to bring those, you do not want to fall out half way through the class, due to not eating. Be sensible in your dress, wear shoes or boots, not flip-flops, where a shirt that buttons up, as there will be hot brass flying around, and it is hot, you may also want a hat, and stashing a rain jacket is not a bad idea. On ammunition, take some of it you are planning on using in class and shoot it before class, also get good ammo, not the cheapest stuff you can find, last year so a very nice 1911 get blown up to poor quality reloads, and had two students who had purchased remanufactured ammo that would not cycle in their guns, and it is ok to bring more ammo that the instructor told you too, but not less than he told you too. Also be friendly and open to your fellow students, there may be new friendships in the making, and be open to actually listening to your instructor, you are after all paying them to teach you, why not get something from it? Most instructors are patient, and will go over a technique several times, but if you keep blowing them off, they will move on to a student that wants help, also keep in mind you are one student in the class, and the other students also paid for instruction, so you needn’t cop an attitude that the instructor didn’t spend the whole day with you, if you want private training then be willing to pay more. Sadly most live in a state of denial, that it won't happen to them, they fool themselves into believing they are prepared enough, a lot of them admit they should get more training, but come up with a bag of excuses why they don't have time, or can't afford it. Many rationalize, "hey I watch TV more than I have to defend myself, so a new bigger brighter flat screen is a better idea than spending money to learn to defend myself" I took a CCW class 2 years ago, and bought some of those expensive hollow points what else could I possibly need?